Are you looking for quality acrylic magnetic picture frames with lowest prices in Melbourne Australia? Are you looking for perspex sign holders and acrylic block Australia suppliers? Here is the right place. 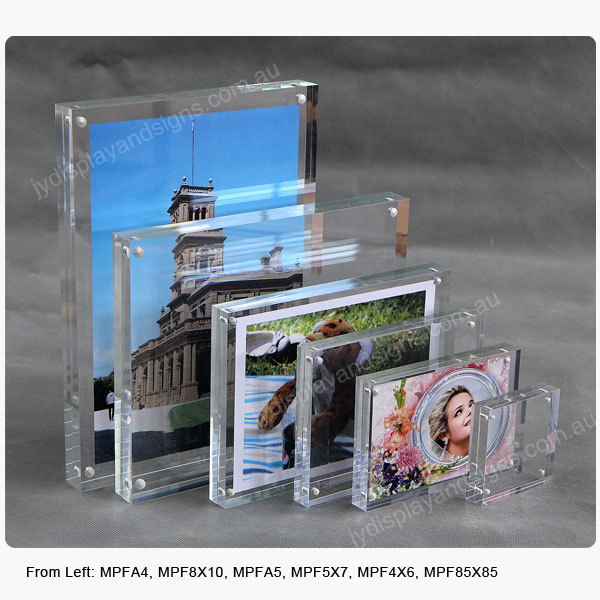 We have been importing and distributing acrylic photo frames since 2009 in Melbourne. We have a big range of acrylic picture frames in stock, our countertop magnetic picture frames have 11 sizes, the sizes 85x85mm, 90x100mm, 100x100mm, 4″x6″, 3.5″x5″, 5″x7″, 6″x8″, 8″x10″, DL, A5 and A4. All the frames are in stock, same day dispatch for orders placed before 1:00 pm. Our acrylic photo frames are made from the top quality acrylic sheet, polished by laser polished machine and hand-buffed, the frames feature crystal clear acrylic to allow your treasured photos, documents, artwork, awards or memories to be showcased in style and with finesse. If you look for wall mount staff board or member photo board, our Staff Photo Boards are a good solution, these clear acrylic pockets display staff photo’s in a clear professional style, and the photos are easy to update. Staff Photo Notice Boards / Employee photo boards are perfect for schools, colleges, universities, public sector, corporate, retail and business.